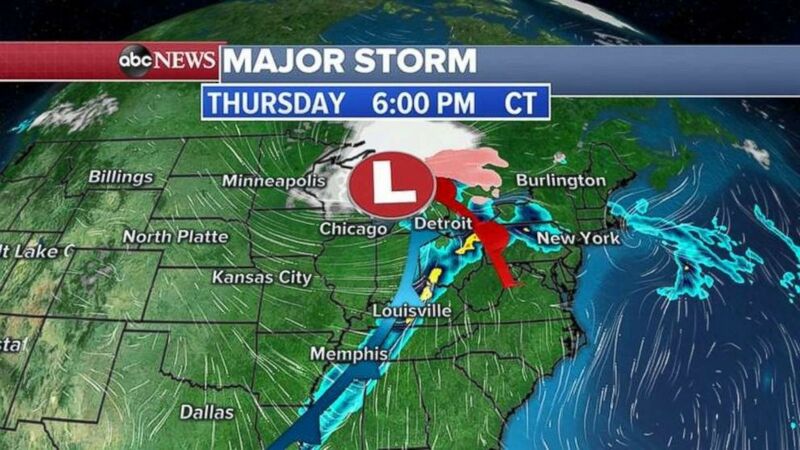 A second storm system is moving through the Midwest on Thursday morning and wreaking havoc from the Rockies to the Northeast. Salt Lake City and Denver got hit hard Wednesday with this storm — roads were a mess with lots of spin out and accidents. Denver area got 3 to 6 inches of snow, while Salt Lake City saw 5 to 10 inches of snow. Ahead of the same storm, warm air turned snow into freezing rain from Kansas City to Wisconsin, making roads treacherous. Farther south, water rescues were necessary as up to 4 inches of rain fell in Nashville, marking a daily record. 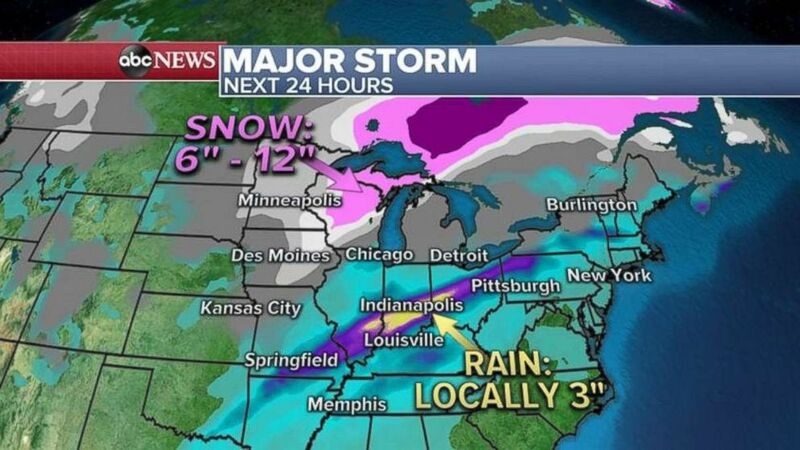 There are alerts in place across much of the U.S. on Thursday for snow, ice or rain. 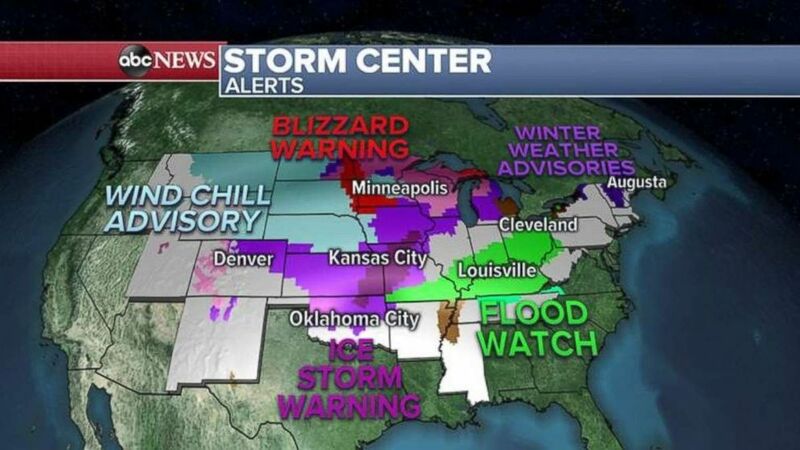 There are 32 states from the Rockies to the Northeast under, snow, ice and flood alerts on Thursday, including a blizzard warning and ice storm warning for the Plains. The storm is now in the Mid-Mississippi Valley and producing severe storms with damaging wind and hail. The storm will move into the Ohio Valley and stretch south through Kentucky, Tennessee and Mississippi on Thursday night. As the storm moves east later on Thursday morning and into the afternoon, heavy snow will break out in the western Great Lakes with freezing rain to the south. Severe storms are expected Thursday for the Ohio Valley with damaging winds, a few tornadoes and some hail and flash flooding also possible. 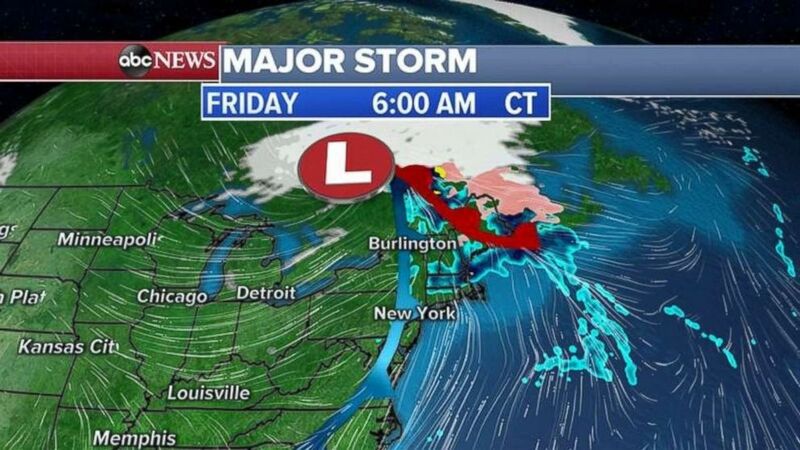 There will be rain and some ice in New England on Friday morning. The storm system will move into Canada, but the trailing cold front will move into the Northeast with some heavy rain at times. Some icy weather is possible in northern New England. In the next 12 to 24 hours, Wisconsin and Michigan could see up to a foot of snow, while the Ohio Valley and parts of the Midwest could see an additional 3 inches of rain. There could be four-tenths of an inch of ice in Kansas and Missouri. Rainfall totals will be highest in the Midwest with some snow in northern Wisconsin. A shelter-in-place order was issued for residents and schools of Crosby, Texas. She skirted multiple layers of security at Mar-a-Lago over the weekend. Hes in solitary confinement, according to a report. She had 74 percent of the vote with 66 percent of the precincts reporting. The 64-year-old driver was hospitalized and treated for facial injuries.